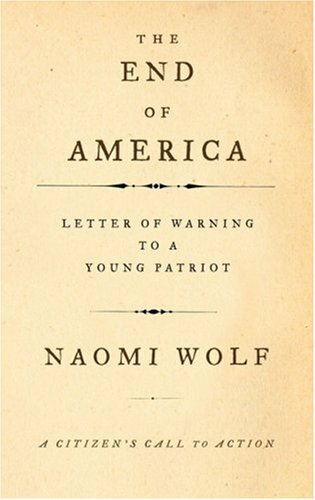 Naomi Wolf’s short, straightforward book is a warning that the prospects for fascism emerging in America are real and growing. She lays out 10 steps that governments take in order to concentrate power and stifle dissent, on the road to fascism, all of which are underway in the good ol’ US of A. This issue is obviously incredibly relevant today, and I happen to agree that fascism is an imminent threat in the US. But I wasn’t terribly impressed by this book. Although I believe the author is or maybe was a radical, the arguments here are very very much within the liberal framework, or even right-libertarian framework, and the pro-U.S., pro-Constitution rhetoric, while serving a function here, does actually cover up the fact that this nation was built on state terror and repressive violence. It’s not a new thing. I think this book also alienated me a bit because it’s heavy on scare-tactic language, and even some implications bordering on conspiracy theory. These all served to make the book something more of interest to the (largely white, male) middle class as opposed to the truly dispossessed of this nation, who would actually be the ones likely to suffer most under a fascist system. What this book DOESN’T do is probably the most important thing, inspire HOPE that regular people can actually PREVENT emergent-fascism, or undo it. Wolf tries, but ultimately I think the effect is to actually scare us and the impression one gets is a gloomy, we’re-fucked, bleak future. Intellectually, that may be alright, but if the intent is to move people to action, this fails horribly and may actually be counterproductive. Worth skimming, but there should be, and probably are, much better books on the subject of the U.S.’ decline into fascism.